Welcome to Bonfire Academy! Set in the foothills of the alpine mountains in St.Moritz, this exclusive private school caters to a special kind of student. Enter at your own risk... but if you are human, you may not want to enter at all. 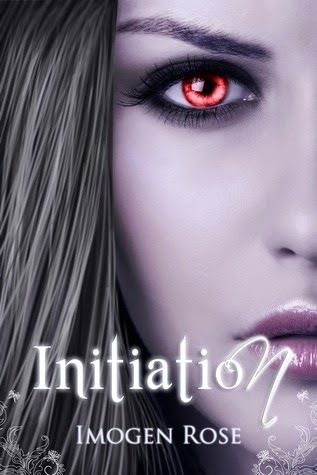 As soon and I read the description that Imogen Rose sent me when she asked me to review Initiation I knew I was really going to like this story, because I absolutely love books that take place at private schools and I absolutely love paranormals, so combining the two is definitely a winning combination for me. The characters were all very well done, as well as the pacing. I never felt like things were too rushed except for the very beginning. Something happens in the first few pages and then never gets fully explained and I felt like there should have eventually been an explanations, but I guess it was at the bottom of Cordelia's list of things to do with everything else going on. The one thing that I really loved about this book is that there is so much going on that it keeps you hooked, because you want to know what happens next in all these storylines. One track storylines are great, but multiple storylines in one book are awesome. I couldn't wait to turn the page and find out what was going to happen next with Faustine's development, or what was going to happen with someone's brother, or what Cordelia was going to do about her love life. Each page I got closer and closer to finding everything out until the end came and I still didn't have all the answers. The ending was done very well. It wrapped up some things and left others open to be continued in the next books, which I cannot wait to read. I did feel like it was definitely a cliffhanger, but I didn't feel like it was one of those earth shattering/life ruining cliffhangers where you need the next book immediately in fear you will die. There was only one thing I really didn't like, which is why it's not a 5 star review. It's that beginning scene that I mentioned was rushed. This scene causes there to be a love triangle. I have conflicting views on love triangles, I like them when both guys are well aware of each other and are "competing" for her, but I don't like it when they aren't aware of each other and one is already with the girl causing there to be slight or full blown cheating happening. In Initiation, only one of the guys is aware of the other and it causes cheating to happen. I really like the guy, and want them to work out, but Cordelia needs to figure it out and not string the other guy along. Cordelia does tell us that it is rare for paranormals to be faithful, but at the same time she seems like the type to try and be faithful. At the end of the book I still really, really liked it and I will definitely be continuing with the series. I really, truly enjoyed this book. The characters were all very unique with their own special abilities and personalities. I absolutely loved that this story took place in a private school for paranormals, such a great combo for my personal tastes. The pacing was also very well done and even though this book is on the longer side, it never felt like it was a long book, because so much is happening. There was only one thing I didn't like, which had to do with the love triangle, but I don't want to put in any spoilers. So just know I loved the love triangle, but at the same time I didn't. Overall, really great story and I will definitely continue with the series!